SMC Edgecore 4-Port Redundant Power Supply. 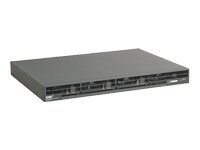 This Redundant Power Unit (SMCRPU14) can supply 600 Watts of backup power to four switches in the event of an AC loss or failure of an internal power supply. It ships with four DC Backup Power Cords included (IEC connectors). Thermal overload protection prevents the RPU from overheating if a thermal overload occurs. Over-voltage protection shuts down an output channel if the voltage exceeds a preset threshold whereas over-current protection shuts down the RPU if the output load exceeds a preset threshold. Short-circuit protection prevents the RPU from being damaged from a short circuit on any output channel. Four status indicators for Link, Activity, Fan, Thermal, and Power are located on the RPUs front panel. While the AC supply and DC backup sockets are located on the RPUs rear panel. The SMCRPU14 can be mounted in a standard 19-inch equipment rack (brackets included) or on a flat surface.